I’ve been looking around for a good Spicy Thai Fried recipe, but each site I looked at prepared it differently. 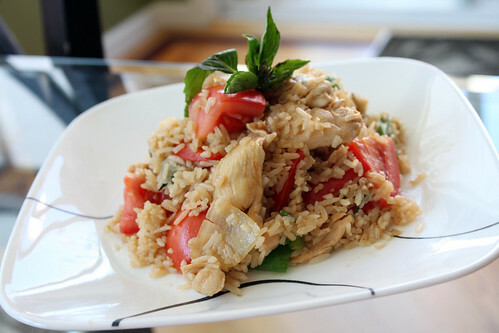 I was trying to find a recipe that tasted like the Spicy Thai Fried Rice I loved at Thai Bistro Restaurant in Davis and I think I found it at http://allrecipes.com//Recipe/thai-spicy-basil-chicken-fried-rice/Detail.aspx . So I looked at the ingredients and read the reviews and comments and got all my favorite ingredients to prepare Spicy Thai Fried Rice for Jane’s roommates from college. Wow! As I am blogging, I am realizing that I am cooking a dish I loved in college and cooking for old college roommates. 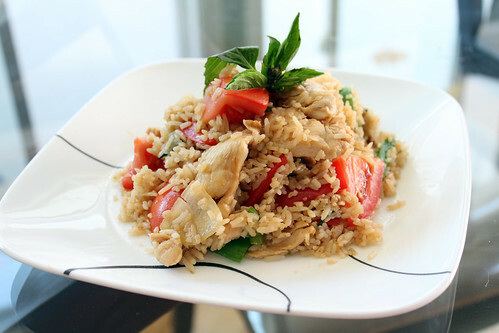 Spicy Thai Fried Rice is such a fragrant, flavorful, and wonderful dish that can be enjoyed by everyone. I think the star of this dish is the Thai Basil. Thai Basil is probably one of my favorite herbs ever. I never knew how to describe the taste, so I went to Wikipedia and the site described Thai Basil as having a subtle licorice or mint flavor. Now I know how to describe Thai Basil, and it is awesome. When cooking the fried rice, you just need to be careful how many chilies you add depending on who you are serving. 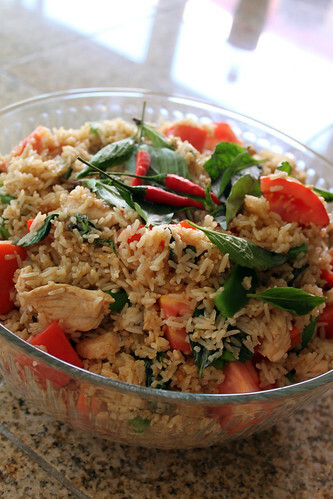 I like my Spicy Thai Fried Rice to be pretty spicy, but my recipe below is more on the Medium side. If you don’t want it to be spicy, you can always substitute chilies for a jalapeno pepper and seed it before dicing. It will still give you a chili flavor but it won’t be overwhelming on your palate. Also, you can substitute flat rice noodles for the rice and I believe it would be Pad Kee Mao. Also, if you don’t want to make Spicy Thai Fried Rice or Pad Kee Mao, you can just cook the chicken as a stir fry and eat it with rice on the side or however you want to enjoy it. Cook rice leave it in the refrigerator or outside until it is completely cooled. In a small bowl whisk oyster sauce, fish sauce, soy sauce, and sugar until combined. Slice green bell peppers, red bell peppers, and yellow onions and put on a plate. Cut Roma tomatoes into little cubes and put on a plate. Finely mince garlic, Serrano chili pepper, and Thai chilies and combine and put it in a small bowl. Heat wok on Medium High and add vegetable oil. Throw in the minced garlic and chilies mixture and begin cooking for about 1-2 minutes. Add chicken and onions and turn the heat to High. While chicken is cooking, you can add 1 tablespoon of sauce. Cook until chicken is almost cooked. Add bell peppers and stir fry for about 1-2 minutes. 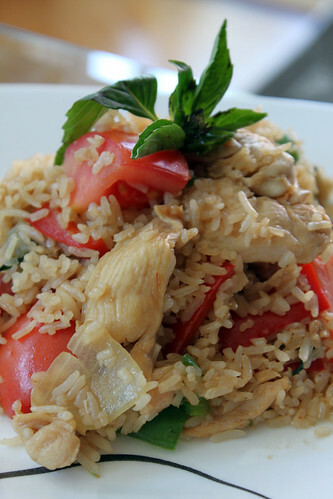 Move all the ingredients to the side, add the rice, remaining sauce, and begin mixing the ingredients into the rice until the sauce is evenly coated. Mix for about 3 minutes. Add Roma Tomatoes and mix for another minute or so. 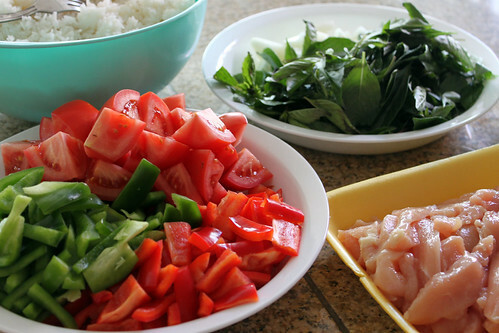 You don’t want to overcook the tomatoes or it will make the fried rice to wet from its juices.